Scientists from Forschungszentrum Jülich and the Paul Scherrer Institute in Switzerland in cooperation with international partners have presented the first semiconductor consisting solely of elements of main group IV. 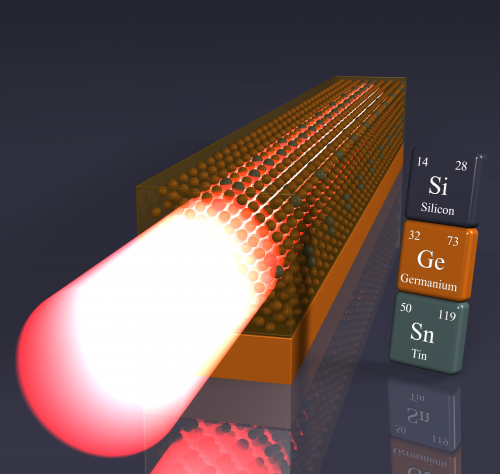 As a consequence, the germanium-tin (GeSn) laser can be applied directly onto a silicon chip and thus creates a new basis for transmitting data on computer chips via light: this transfer is faster than is possible with copper wires and requires only a fraction of the energy. The results have been published in the journal Nature Photonics. The transfer of data between multiple cores as well as between logic elements and memory cells is regarded as a bottleneck in the fast-developing computer technology. Data transmission via light could be the answer to the call for a faster and more energy efficient data flow on computer chips as well as between different board components. "Signal transmission via copper wires limits the development of larger and faster computers due to the thermal load and the limited bandwidth of copper wires. The clock signal alone synchronizing the circuits uses up to 30% of the energy – energy which can be saved through optical transmission," explains Prof. Detlev Grützmacher, Director at Jülich's Peter Grünberg Institute. Some long-distance telecommunication networks and computing centres have been making use of optical connections for decades. They allow very high bandwidths even over long distances. Through optical fibres, signal propagation is almost lossless and possible across various wavelengths simultaneously: a speed advantage which increasingly benefits both micro- and nanoelectronics. "The integration of optical components is already well advanced in many areas. However, in spite of intensive research, a laser source that is compatible with the manufacturing of chips is not yet achievable," according to the head of Semiconductor Nanoelectronics (PGI-9). The basis of chip manufacturing is silicon, an element of main group IV of the periodic table. Typical semiconductor lasers for telecommunication systems, made of gallium arsenide for example, however, are costly and consist of elements from main groups III or V. This has profound consequences on the crystal properties. Such laser components cannot therefore be applied directly onto silicon. They have to be produced externally at great effort and subsequently glued to the silicon wafer. However, the lifetime of this kind of component is greatly reduced due to the fact that the thermal expansion coefficients of these elements are significantly different from that of silicon. In contrast, semiconductors of main group IV – to which both silicon and germanium belong – can be integrated into the manufacturing process without any major difficulties. Neither element is very efficient as a light source, however. They are classed among the indirect semiconductors. In contrast to direct semiconductors, they emit mostly heat and only a little light when excited. That is why research groups all over the globe are intensively pursuing the objective of manipulating the material properties of germanium so that it would be able to amplify optical signals and thus make it a usable laser source. 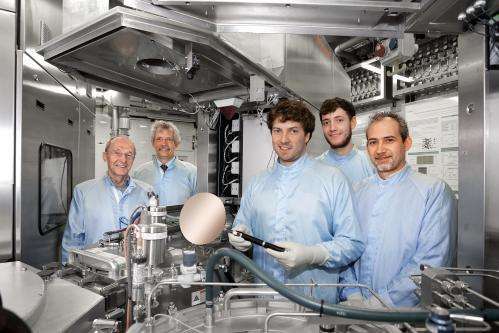 The scientists at Jülich's Peter Grünberg Institute have now for the first time succeeded in creating a "real" direct main group IV semiconductor laser by combining germanium and tin, which is also classed in main group IV. "The high tin content is decisive for the optical properties. For the first time, we were able to introduce more than 10% tin into the crystal lattice without it losing its optical quality," reports PhD student Stephan Wirths. "The functioning of the laser is so far limited to low temperatures of up to minus 183 degrees Celsius, however. This is mainly due to the fact that we worked with a test system that was not further optimized," adds Dr. Dan Buca. In cooperation with his colleagues from Prof. Siegfried Mantl's group at PGI-9, Stephan Wirths applied the laser directly onto a silicon wafer whose properties were subsequently measured at the Paul Scherrer Institute in Switzerland. PhD student Richard Geiger fabricated the laser structures there. "That way, we were able to demonstrate that the germanium-tin compound can amplify optical signals, as well as generate laser light," reports Dr. Hans Sigg from the Laboratory for Micro and Nanotechnology. The laser was excited optically for the demonstration. Currently, the scientists in Dr. Dan Buca's group at Jülich are working on linking optics and electronics even more closely. The next big step forward will be generating laser light with electricity instead, and without the need for cooling if possible. The aim is to create an electrically pumped laser that functions at room temperature. The laser beam is not visible to the naked eye. GeSn absorbs and emits light in a wavelength range of about 3 micrometres. Many carbon compounds, such as greenhouse gases or biomolecules, also display strong absorption lines at this boundary between near and mid-wavelength infrared. Hence, sensors made of GeSn promise a new possibility of detecting these compounds. Along with computer chips, completely new applications that have not been pursued so far for financial reasons may thus benefit from the new laser material. Gas sensors or implantable chips for medical applications which can gather information about blood sugar levels or other parameters via spectroscopic analysis are examples. In the future, cost-effective, portable sensor technology – which may be integrated into a smart phone – could supply real-time data on the distribution of substances in the air or the ground and thus contribute to a better understanding of weather and climate development.